Part of our ongoing series on timesheets and time management for project leaders. In this video, Jennifer Bridges, PMP, discusses 5 ways to improve time tracking with your team for more efficient projects and better project success. Instead of logging actuals on task after completed, create up-front estimates with your team. Including them helps make the team member mindful of their own progress according to the goals they set, so they’ll be more able to alert you when there are issues with their ability to deliver on time. Rather than grouping time by individuals only, track time by specific projects. This helps you to see the allocation of time across multiple projects. And we all know, our teams have multiple projects each going on simultaneously! Where you have complex time tracking methodologies, simplify. This can happen when one system, such as a financial or billing application, is used to track time rather than a dedicated time-tracking tool. Simplify tools for your team. You may want to roll out a clear project management and time-tracking tool, such as ProjectManager.com, so that your team can accomplish time-tracking simply and intuitively. Don’t block access, but provide easy access and good tools. The right tools matter, particularly if you are managing distributed or remote teams. Make sure all resources on a project can access the project management or timesheet tools in the cloud. When there’s too much data, customize by individuals. Filter views or provide team-member-level access to the tools, so they only see what is essential for them to be efficient. You don’t want to waste their time digging through unnecessary data just to update their own timesheets. You want to track time as efficiently as possible, in order to make sure that the time your team spends working on the project is project-related. You might need to loop your team into the overall value of tracking time for the project and the organization, in order to get buy-in and not push back. Pro-Tip: Sometimes, no matter how efficiently you manage the scope of your project, there are things beyond your control. For example, you may have an unmotivated team member or even the entire team may need a kick start. This isn’t something you must blindly accept, but rather manage. Take it further: Read Jason Westland’s article on how to get your team to use timesheets. 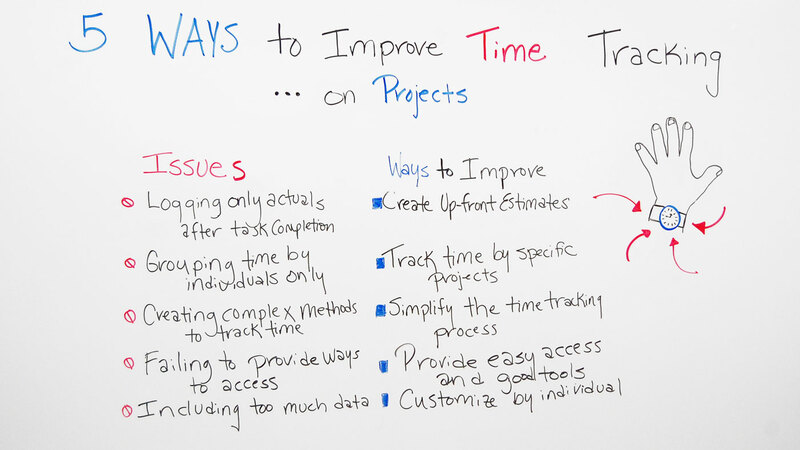 Time is so important to project managers on project success that today we’re going to talk about five ways to improve time tracking specifically on projects. It doesn’t really matter what industry we’re looking at. We found that there are five common issues that commonly occur no matter what project. They look like this. One is when individuals are logging actuals on task after they’re completed. They’re not really measuring against anything. We found a way to improve this is to create up-front estimates. That way, you as the project manager can estimate the project better. The individual can measure and track their progress for their task better, as well. They will know then, are they behind schedule? Are they ahead schedule? And they can alert you as the project manager when a problem occurs. The second thing is grouping time by individuals only. This typically happens within an organization specifically for an employee because employees know that they have so much time per month, per week, per day. So they are just logging time according to their time as an individual. What we want to do to improve that is track time by specific projects. Because generally individuals within an organization are working multiple projects and so we want to allocate that. We want to allocate a percent by project so they’re not fully allocated but to one but working on multiple projects. The other issue is creating complex methods to time-tracking. Sometimes that’s done by the project manager inadvertently and sometimes it’s done by the organization. They may have financial planning systems that they use for complex billing and other applications. And then they’re forcing the team members to use those financial application systems instead of the project management system or project management tool. We found that a way to improve that for time tracking is to simplify the time tracking process. Basically, the people need to know when are they supposed to log their time, where are they supposed to log the time, and how. Another issue is failing to provide ways to access the tool. So we want to provide an easy way to access and we want to provide good tools. In today’s times there are a lot of project management systems. There are many apps available that you can set up so that people can access the tool, specifically where they’re remote. A lot of teams are remote. They may be in another part of the building. They may be in another part of the city or even out of the country. So they need to be able to get access to a common repository or common tool. The last one is including too much data. If you give your team members too much data to look at . . . What I see commonly is the project manager just provides everyone everything. Everybody is looking at everyone else’s task and instead of their own. It gets so overwhelming, they really forget to or they don’t want to log the time. We want to customize what they’re seeing by individual so they see only their task, their activity, that they can log time to. These are some of the common issues. These are some of the common ways we’ve found to improve. And if you need a tool that can help you improve your time tracking, then sign up for our software now at ProjectManager.com.